"David Bookbinder is one of those awakened souls whose near-death experience gave him fresh and timeless eyes. He has taken that gift and poured it into Paths to Wholeness, using innovative photography and heartfelt reflection to surface and praise the mysteries of the inner world." Many of us long to be fully present to this amazing existence we were born into, and often we can. But sometimes, we look for help. In Paths to Wholeness, psychotherapist, writer, and photographer David J. Bookbinder brings his capacity for inspiring personal transformation to his readers. 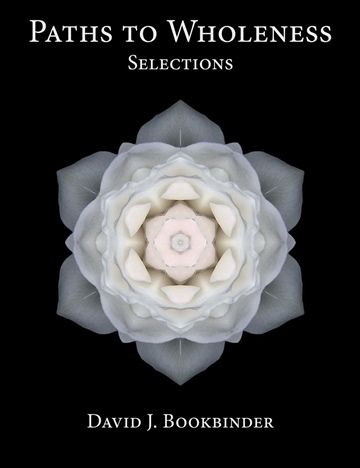 Combining insightful, pragmatic essays in the lineage of Carl Jung and Mark Nepo with award-winning Flower Mandala images inspired by Georgia O'Keeffe and Harold Feinstein, David both shows and tells the tale of a spiritual seeker who, having traversed his own winding path toward awakening, now guides others to find balance, build resilience, overcome fear, and to expand their hearts by listening deeply, inspiring hope, and more fully loving. Carry it with you throughout the day, or page through it as you drift off to sleep, knowing you are not alone on your journey to self-actualization. TIP: For a more vivid experience of the images, try setting the Kindle background to Black. David Bookbinder's Flower Mandalas contain both the shock of recognition and the delight and surprise of originality. They are flowers and jewels at the same time. They will enrich anyone's feelings about what a flower is. More than just an arresting coffee table book, Paths to Wholeness: Fifty-Two Flower Mandalas also serves as a guide for successfully traversing the hills and valleys of our existence. The photography is stunning and the short essays that accompany each image are drawn from David's considerable life experience, spiritual and therapeutic training, and innate and accumulated wisdom. Paths to Wholeness: Fifty-Two Flower Mandalas is itself a mandala - a symbol of wholeness. I experience David's nurturing each time I read it, feeling his presence as a fellow traveler and seasoned counselor. He encourages our growth as we move forward in our own journeys, healing our wounds and loving more deeply. David Bookbinder's Paths to Wholeness: Fifty-Two Flower Mandalas is an invitation to join him on a journey of exploration into the deepest levels of being. The words compelling, engaging, moving, and powerful only hint at the profound gifts contained in this beautifully written, authentic and unusual memoir / photography / mandala book. It is almost too rich to take it all in, in one or two sit-tings. Savor each essay and take time to absorb the richness of this collection.